Pongal is a popular rice dish, originating from the Indian subcontinent. There are two varieties of pongal, Chakkara Pongal which is sweet and Venn Pongal, which is savory. 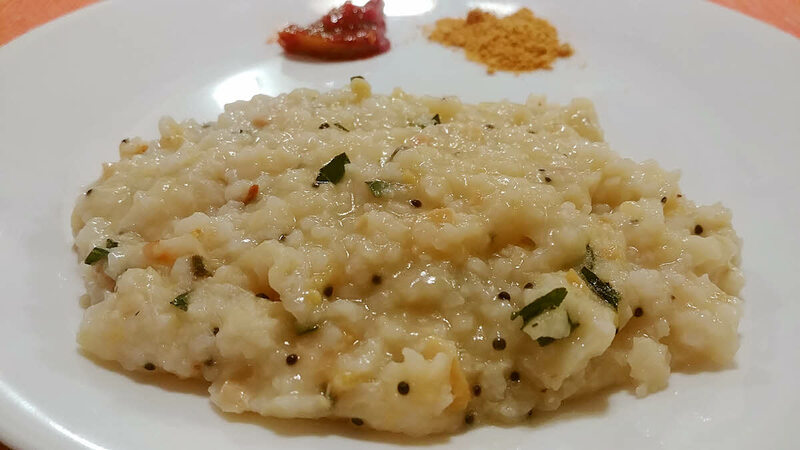 The unqualified word pongal usually refers to the savory pongal, and it is a common breakfast food item in South India. Wash rice and dal and cook them in pressure cooker with peppercorns, salt and 3 cups of water. Once it whistles, lower the heat and wait for 5 minutes and then switch off the flame. Open the cooker when steam dies down. Rice and dal should be soft and mushy. You can mash them a bit if you want or leave it as it is. Chop ginger and green chillies finely. Chop cashews roughly and keep aside. Now prepare the tempering. Heat the ghee in a pan and add mustard seeds. You may want to cover the pan as the seeds will splutter. Once the seeds have popped, add the whole red chilli. Once the chilli is fried, add finely chopped ginger, green chillies and curry leaves. Fry them for a couple of minutes and then add roughly chopped cashews. Again fry for a minute but don’t let the cashews brown. Turn off the heat and pour the tempering on the rice and dal mixture. Mix everything thoroughly and pongal is ready to serve. If you feel that it’s too dry, add a little water and cook a bit. Serve it with gun powder and spicy pickle.